The Blendtec Classic 575 blender has incredible versatility to bring you the ultimate all-in-one appliance creating whole fruit juiceS, hot soups, ice cream and lots of other delicious recipes in a matter of seconds! 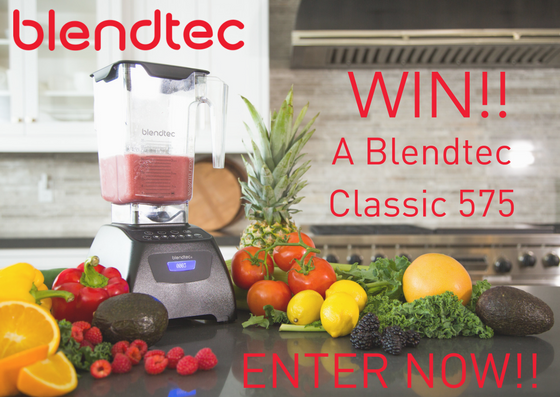 To win a Blendtec Classic 575, follow BlendtecUK on Facebook (www.facebook.com/blendtecuk), Twitter (www.twitter.com/blendtec.uk) or Instagram (www.instagram.com/blendtecuk) and comment on the corresponding competition post of the platform (max 1 entry per person per platform) telling us what you would like to blend. All entries will be put into a draw and a winner picked at random on Thursday 19th October 2017. The competition closes on Wednesday 18th October 2017 at 23.59. The promoter is: Luba Distribution Ltd, 9a Newcastle Drive, NG7 1AA, Nottingham, UK. A company registered in the United Kingdom and Wales; company registration number 10221096. The competition is open to residents of the United Kingdom (incl. Northern Ireland) as well as the Republic of Ireland. You must be aged 18 years or over to enter. There is no entry fee and no purchase necessary to enter this competition. The entrant can enter the prize drawing by following BlendtecUK on facebook, twitter or Instagram and commenting on the corresponding competition post of the platform. One entry will be accepted per person on eachthe following platforms – facebook, instragram or Twitter. You can therefore enter just once or a maximum of three times to increase your chances. Users found to enter with fake/duplicate accounts will be excluded from this competition. Closing date for entry will be Wednesday 18th October 2017 at 23.59. After this date no further entries to the competition will be permitted. The prize is as follows: A Blendtec 575 Classic blender, colour determined by LUBA Distribution Ltd. The prize is as stated and no cash or other alternatives will be offered. The prize is not transferable. The prize is subject to availability and we reserve the right to substitute this prize with another of equivalent value without giving notice. A winner will be chosen at random – we will randomly pick 10 users that complied with our T&Cs from Facebook, Instagram and Twitter using a random user selector tool. From these 30 users we will pick one at random to win the prize. The winner agrees to the use of his/her name and image in any reasonable publicity material. The winner’s name will be available until 28 days after closing date by emailing the following address – winner201702mp@blendtec.uk. Luba Distribution Ltd shall have the right, at its sole discretion and at any time, to change or modify these terms and conditions, such change shall be effective immediately upon posting to this webpage. Luba Distribution Ltd also reserves the right to cancel the competition if circumstances arise outside of its control.